A fighting tournament run by an unknown evil has come to Earth. Choose a fighter and work your way through the challengers one by one to face the final battle. You get two lives during each fight within which to win. As well as punches, kicks and blocks, unleash special attacks and devastating combos to bring an end to your opponents quickly. 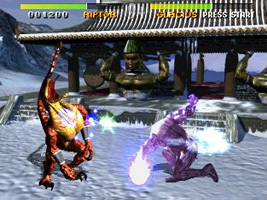 The game uses the pre-rendered CGI graphics technology pioneered with Donkey Kong Country, plus the arcade version featured high resolution sprites and FMV backgrounds. The character Sabrewulf is named after the antagonist in the classic Rare game Sabre Wulf on the ZX Spectrum from 1984.